Engraved on bell: Manufd by Martin, Pollmann & Co, New York. Brothers Godfrey Robert Martin (ca. 1835-ca. 1900) and John Henry Martin (1835-1910), natives of Dresden, established a partnership in 1872 with Henry August Pollmann (d. ca. 1905), of Markneukirchen. Henry Distin (1819-1903) emigrated from London in 1876 to become superintendent of the large factory, located on Courtlandt Street. 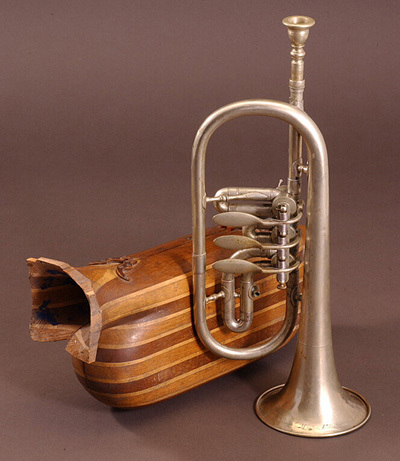 Robert Martin ran the firm, while Pollmann handled the importing of wind, string, reed, and percussion instruments. Body: Similar to NMM 6982. 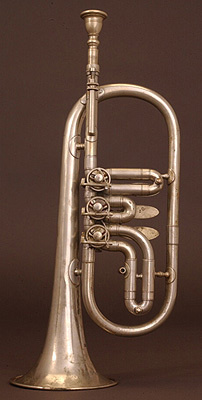 German-silver with single-looped tubing: leadpipe with telescopic tuning slide; valve segment; first bow; conical bell bow and bellpipe in one integral part to the right of leadpipe; French rim. 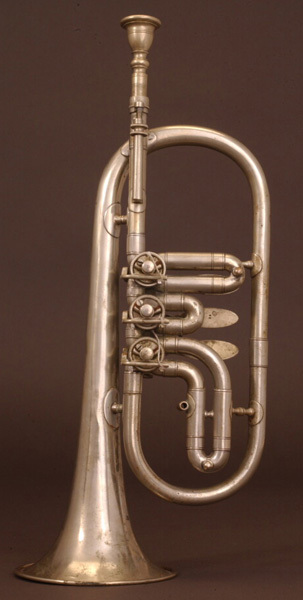 Valves: Three side-action, string-operated rotary valves. Spiral-spring return mechanism; reciprocal driver pivot stopped by V-shaped cork buffers. Inner slide tubing. Windway: first, second, third valve. Accessories: Shaped wooden case made with alternating strips of walnut and maple. Mouthpiece. Sounding length: 912 mm; internal diameter, leadpipe: 10.6 mm; bore diameter (inner valve slides) 10.5 mm; bell diameter: 105 mm.